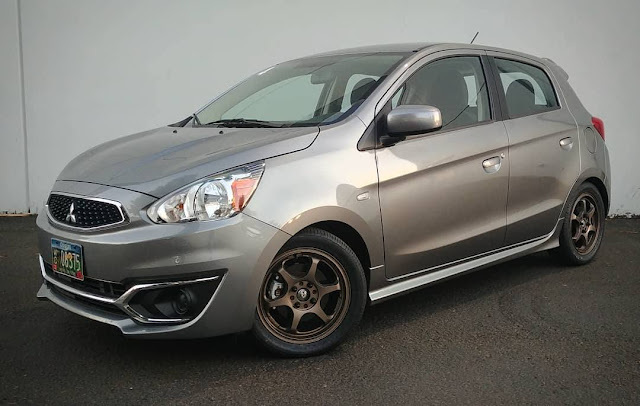 Well, here we are, 16 days into 2019 and The Rage, our 2017 Mitsubishi Mirage, has new shoes. If you'll remember, I had shod the hatchback with 15x6.5 (et 38) MB Revolts with 195/50/15 Yokohama S.Drive tires. Almost immediately, however, I found that 195s on the Mirage were too wide. We had extreme rubbing on the rear under hard cornering, while driving over bumps, and with any passengers. This was to the extent where the wheel well's lip was taking strings of rubber from the sidewall. In addition, unless you're racing a mirage, a 195 is more tire than this car will ever need. In fact, even in racing it might be more tire than it needs. I mulled over rolling and pulling the fenders, but after doing some measurements, it'd take significant massaging to get those 195s to fit without rubbing, and they still might rub. They had to go, and they did. I rolled around on the stock, lilliputian 165/65/14 low rolling resistance Dunlop Enasaves for a while until I figured out what to do. I knew I wanted something narrower than the 15x6.5 wheels, I wanted something with more offset than 38mm, and wanted a tire size of 185mm at a maximum. I considered running a 14" wheel and tire, but the wheels look too small to me. What I really needed was a narrow 15" wheel with a high offset. And after searching for tires, I decided I'd run the factory-optional 175/55/15 tire size. But there were still decisions to be made. I looked at pretty much every wheel available for sale new in North America, but all the wheels were still not the right specs—there's hardly anything narrower than a 15x6.5. I didn't want stock wheels, I wanted something with a different, sportier style. Then I found Japanese auto parts seller, Croooober (yes, with four "o" letters). Unlike other places to buy wheels from Japan, Croooober also will ship them to you directly. This eliminates the need to find a middleman to ship them, saving time and (potentially) money. Crooober allows you to refine your search by specifying the offset, width, diameter, bolt pattern, and condition of a wheel. So I was able to dial in a 15x5 with an offset from 40mm to 47mm. There were scads to choose from in all sorts of styles and price ranges. 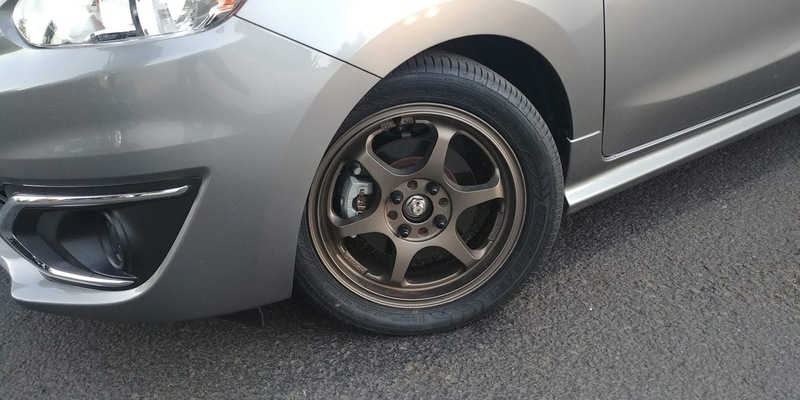 I ended up finding a set of these 5Zigen Pro Racer GN+ wheels in bronze. They were lightly used with very few blemishes. 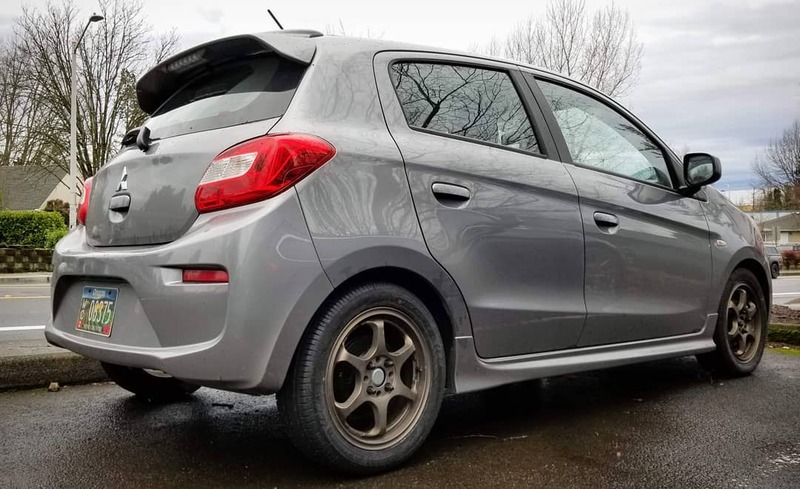 They are a kei car fitment with a 15x5 size with a +45 offset—perfect for the finicky Mirage fitment. Plus, they weigh just about 12 lbs. Shipped to my house from Yokohama, Japan, these wheels cost just a tick over $400. Now for tires. Before mounting and balancing the setup, I made sure the center bore was right, and it was. I took the tires to get mounted, balanced, and installed. I was very happy with the look! Frankly, I love it. I've had the setup now for over a week and I really like it. The AS-1s have offered a quiet, comfortable ride, and the right amount of grip for a street tire, even in spirited situations. In the rain, it's felt confident and planted, and despite the Mirage's mushy steering, The AS-1s have offered an improvement in overall handling. Keep in mind, I have never intended my Mirage to be a track toy, but rather a fun-to-drive commuter that is entertaining, frugal, and not too harsh. I'm very impressed with the Nankang AS-1 thus far, and look forward to more time with them. Our Mirage continues to please as a fun, fuel-efficient commuter. It was cheap to buy, has been cheap to maintain, and is still getting around 40 MPG, even on the wider non-low-rolling-resistance tires. And now that it doesn't rub over all the bumps, it's much more pleasing to pilot.